Alciato at Glasgow: Emblem: In avaros, vel quibus melior conditio ab extraneis offertur. De ceulx qui ont bon heur par estrangiers. On the avaricious; or being treated better by strangers. Hocque aures mulcet, fraenat & ora sono. Quique viris rapimur, piscibus eripimur. Astride a dolphin, Arion cleaves the dark blue waves, and with this song charms the creature’s ears and muzzles its mouth: “The mind of wild beasts is not so savage as that of greedy man. We who are savaged by men are saved by fish”. Il chet sa chanson accomplie. Contre le mal que l’homme apporte. 1. 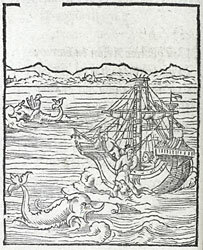 The first Wechel edition in 1534 had a different woodcut. 2. The crew of the ship on which the celebrated musician Arion was travelling, after robbing him, prepared to throw him overboard. He persuaded them to allow him to play his lyre for the last time. Then, after invoking the gods, he jumped into the sea, whereupon a music-loving dolphin conveyed him to land. See Aulus Gellius, Noctes Atticae 16.19.